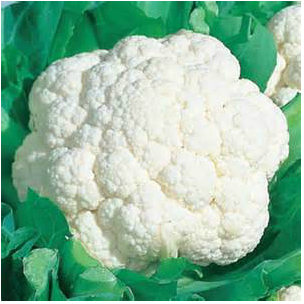 Snow Crown Cauliflower produces a snow white head that is tight and compact. Snow Crown Cauliflower is grown organically. It will grow from 12" to 15" tall and just as wide. Plant in full sun and well drained soil. The heads will mature at about 7" to 8". Harvest when the head is still tight and compact. Snow Crown is an All American Selection winner. Matures in 50 to 60 days. Graffiti Cauliflower produces a purple head that is tight and compact. This is a truly bright and different addition to the vegetable garden. It will grow from 10" tall to 12" wide. Plant in full sun and well drained soil. The heads will mature at about 7" to 8". Harvest when the head is still tight and compact. Matures in 80 days.